L’apéro, short for apéritif, is not a drink, it’s a happening. In fact, it’s something of a sport in France: around here they call it ‘apérobic’. It can be performed at least daily, anywhere and at any time, individually, in small or large groups. I’m not much of a one for cocktails or fancy mixed drinks. Mostly I eschew the sweet in favor of the dry, the bitter and the acidic. Thankfully there are always several of those options at hand in France. And summer is the perfect time to enjoy a nice cool one by the beach, at the bar or here on my own deck. Pour a small amount (according to your taste – I like the equivalent of a couple of shots) over lots of ice. Watch it turn from clear yellow to milky white. Sweat a moment or two along with the glass. Then add water, very cold, to make a refreshing long drink. Enjoy with salted nuts of your choice. Santé! I enjoy the one but cannot drink two. It’s just too rich. And the aniseed flavor is a novelty that (for me) wears thin all too quickly. Oddly enough, pastis has the reputation in France of being the hard-core drinker’s drink. The one that the men guzzle in all those hole-in-the-wall bars that we women hardly dare to enter. 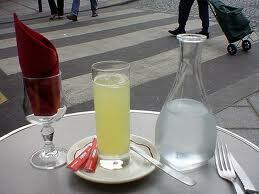 If I should occasionally feel the need to whet my whistle while resting my liver, I might order a citron pressé. This is, quite literally, a fresh squeezed lemon juice (not to be confused with ‘limonade’, a soft drink). It will be served in a tall glass with lots of ice, several packets of sugar on the side and a long spoon for stirring. I don’t mind it straight but a bit of sugar helps the citrusy medicine go down even better. I remember when I first discovered rosé wine in France. It was a revelation: a wine between red and white that offered a little of each. Then I went back to Canada and tried to find it there. Those were the days when Mateus was the only rosé anybody had ever heard of – sweet, sickly lighter fluid. 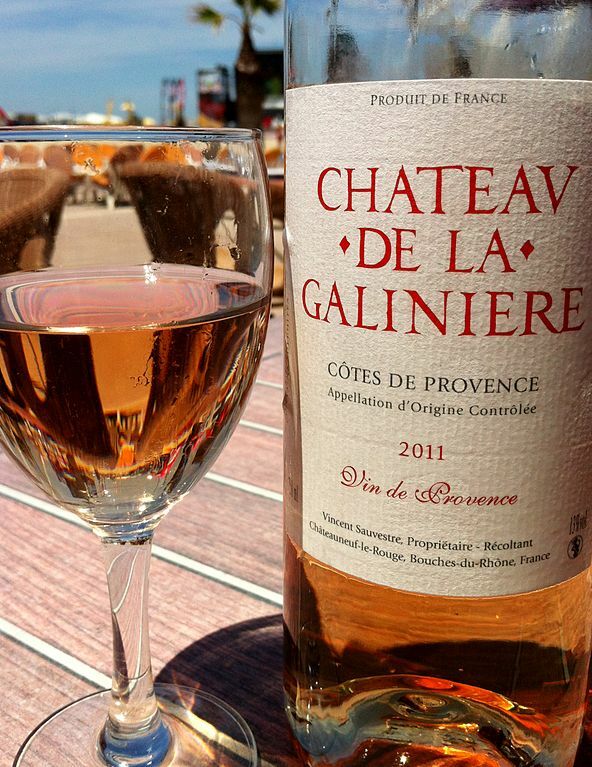 People believed that rosé was blended from white and red (which does sometimes happen but is not allowed in France). Now, of course, all that has changed. Rosé has become the summer wine of choice and is available just about everywhere. There are hundreds of choices and this recent article gives a good overview. The latest trend is palest-of-pale rosé, a grey-orange-pink in color. Personally I still prefer the fuller bodied rosés, the Tavels and the Costières de Nîmes. The French drink rosé all year long but especially in the summer, when it goes so well with just about everything enjoyed outdoors. Let’s not forget my favorite summer brew. La bière. I would not be a Canadian if I didn’t enjoy beer in the summer. Also in the spring, fall and winter. French beers may not be the world’s best but most bars have them on tap. 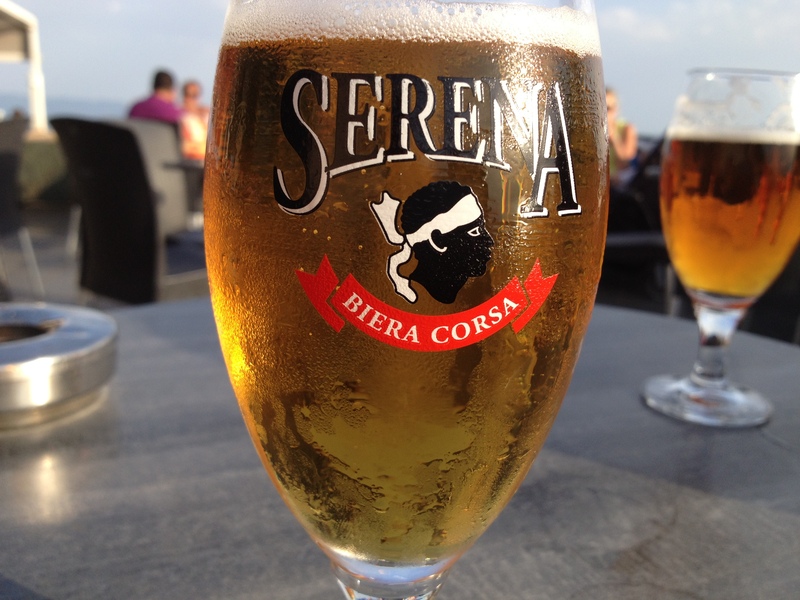 To order a draft beer or ‘une pression’ in France, you ask for ‘un demi’ (half a pint). Draft beer on a summer day. Does it get any better than this? How about you? What’s your favorite summer drink? Happy Canada Day to all my fellow beer drinkers! Picpoul de Pinet – great choice for summer! That crisp edge of almost effervescence. Lucky for me my granny never told me not to drink alone – as my husband is on a health kick and almost never indulges these days. That doesn’t stop me….but I do try to hold off until after 12! Sirop is a great way to get the flavor without the booze. Cheers! Sante! 🙂 Oh and if my husband is even vaguely in the same country I fly in the face of Granny – unfortunately he is 80% not in France and whichever way I wing it I feel I should be ‘dry’. Luckily for me my daughter arrives next week so watch out Picpoul, here we come! In that case, tchin tchin! If I were to take up drinking again I think it would be Pernod or Ricard both of which were my tipple of choice at one time. It got so bad that eventually I couldn’t even stand the taste of aniseed balls and had to vary a bit. I went through a beer phase next. This was all many years ago of course, I doubt Moses still has his vinyards. Fond memories….sometimes I go a few days without drinking for form’s (and my liver’s) sake. Does a body good. Also good when the hiatus is over. But there are some half-way decent non-alcoholic beers these days. And I ca even enjoy tonic without gin! Here’s looking at you, kid. Bises! I have my own version of pastis – definitely not the french way but a good measure in a long glass with an equal amount of blackcurrant cordial (or cassis if you don’t need to be coherent afterwards…….) topped up withdraw cold sparkling water and a slice of lemon – delicious! My children used to call it “mummy’s medicine” when they were younger due to the acquired taste…..!! For a delicious non-alcoholic drink it would be sparkling elderflower every time. Santé! Mummy’s medicine – ha! Sounds like my kinda kids! 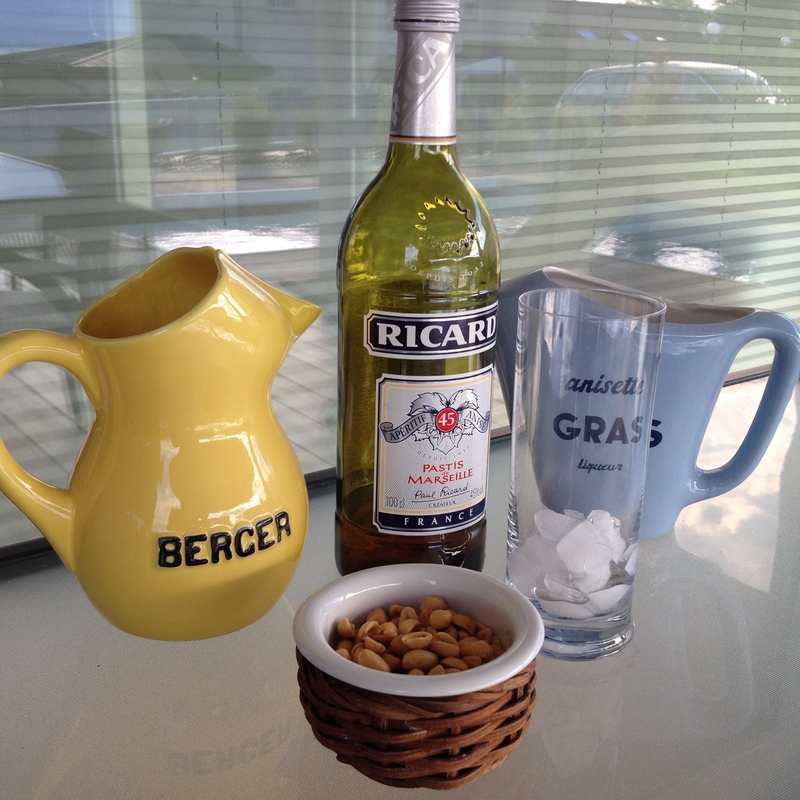 Sounds like we are made for apéros together – I too enjoy a pastis (or two), beer and rosé. I leave the girly cocktails to the French women. PF’s granny never got ove rthe shock of me drinking “like a man”. I told her that I was part of the new generation, and proceeded to drink the men under the table. Love it! My belle-mère (dearly departed) was always shocked by my beer drinking…and especially when I joined the men-folk in une petite goutte or un calvados. Look forward to a blogger apéro one of these days – your place or mine? Oh yes! I sometimes feel like a one-woman roadshow to shake up all those stereotypes. Yes please, I’ll taste the wine. And oui, that beer is for me, not my husband. He’s the one drinking water. Good on ya for drinking ‘comme un homme’. I’ve also been told I spit like a man, and I swear like one too! When we order a coffee and a half pint of beer, we always have to swap the order around when it arrives on the table. My French girlfriends just roll their eyes and smile. Pamplemousse pressé or a sparkling rosé are best for the summer. I’m regretting taking on so many students this summer because I seem to be teaching every time I get invited for an apéro or “‘apérobic” — can you substitute this word/happening for aerobics? I wish! I’d be in fighting form if it were that easy 😉 Seriously, you need to book some time off for the all-important apéros! Agree. Ice-cold is the only way to go with white. Cheers! Glad you enjoyed the site (and sights!). Looking forward to checking out yours. Cheers!